Have a different tree service company in mind? Contact us or have them contact us directly. Hire us to mill your trunks into wet lumber. No minimum required. Hire us to mill & dry your trunk(s) into kiln-dried lumber. Requires approximately 500 board feet minimum. Hire us to fabricate a custom project for your home using the lumber we mill from your tree trunk(s). Requires approximately $3,000 minimum project cost. Does my tree qualify for your mill & dry (lumber) service or as a donation? We accept only single-stem, hardwood (deciduous) tree trunks, cut to a foot above the first main branch. The trunk, from about a foot above the ground to the first main branch, should be a minimum of 102” long and 18” in diameter, and left in its entirety to the extent possible. The trunk should be solid and straight (none that are rotting, curved, or have branch inclusions) which we will need to confirm by visual inspection. To help us determine if your tree trunk can be reclaimed, email us a picture along with the dimensions. Please let us know if you intend it to be a donation, or what service you are interested in. If it is meant to be a donation, please include your address. We will let you know if your trunk is acceptable. If we are providing a service, we will send our Log Information Form to move the process forward. Will you cut my tree down in exchange for donating the tree? Tree removal is not in the scope of our business. You will need to hire a tree service provider to cut the tree down. How do I get my trunk to your facility? The trunk will need to be left outside of any fencing, within 10’ of a street, and with 20’ overhead clearance—in a place it will be allowed to stay for up to two weeks. Please do not leave any additional limbs without prior approval. Please let us know when your trunk is ready for pick-up, confirming it has been left for us as indicated above. Please allow 2 weeks for us to execute the pick-up. In the case of a donation within the metro area, we will pick-up at no charge to you. Please include your address along with your emailed picture and dimensions (above). In the case you’re hiring us to perform a service, you will pay the hauling fee. A non-refundable hauling fee deposit will be due along with your Log Information Form. What if I want you to use the lumber from my tree to fabricate a custom project? We would like to provide a project estimate along with your tree’s confirmation, to help you determine your level of commitment to this trajectory. Please include in your email the project you have in mind along with dimensions and a picture or drawing of your design concept. 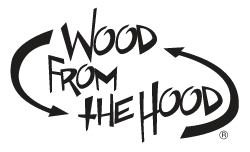 Is my tree worth money?Wood From the Hood does not compensate for tree donation; however, you can find more information from the Department of Natural Resources on what a tree may be worth on the lumber market. Is it OK to use diseased wood such as Emerald Ash Bore or Dutch Elm or other trees that have died due to disease?Yes! In general, the core of the tree is not infected and it is only a matter of removing the bark and a small amount of surface wood to make the tree useable.